Continuing the week’s theme of HDR tips, here’s one that can help out in situations where you find yourself wanting to shoot a bracket for an HDR but you don’t have access to a tripod. I don’t shoot many handheld HDR brackets but sometimes I don’t have a choice – either tripods are banned or I don’t have one with me. In this case, here are a few tips that can allow you to get the shot even without your trusty tripod. 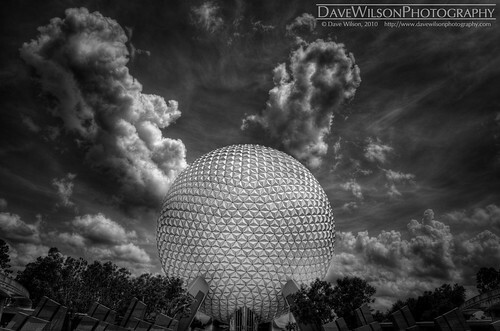 For reference, the shot above is a 7 exposure, handheld HDR shot at EPCOT in Walt Disney World. If your camera allows you to shoot more than 3 shots in automatic bracketing mode, set it to bracket a couple of shots wider than you normally would. If you would normally set up for a bracket of 3 exposures, for example, set it for 5. You won’t get a chance to tweak exposures after shooting your handheld bracket if it’s not wide enough so this helps minimise the chances of you having to reshoot the whole thing if you don’t get it first time. If your camera only allows 3 shots in the sequence, stick with that. Set your camera to high speed continuous shooting mode. The idea here is that you want to hold the shutter down and have the camera rip through the whole bracket as quickly as possible. Even if you can’t shoot at 8fps, 3fps is still better than you are likely to do pressing the button once per shot so go with what you have. Set your aperture so that the longest shutter speed in your bracket will still be in the safe handholding zone (1/focal length). If you are taking a 5 shot bracket, your slowest shutter speed will be 4 times the center setting (+2EV). If you are taking a 7 shot bracket, the slowest will be 8 times the center (+3EV). Typically, I will shoot 5 or 7 shot brackets and try to get my initial shutter speed in the 1/750 to 1/1000 range with a standard lens. This ensures that you won’t have problems with camera shake at one end of the bracket. Put your feet apart, brace your elbows by your sides and hold the camera firmly against your eye. Frame the shot and then squeeze and hold the shutter trying to move as little as possible in the process. In continuous mode, my Nikon cameras will shoot the entire bracket then pause to allow me to take my finger off the shutter. Once you’ve done all this and have your handheld bracket back in the computer, probably the most important tip is to forget Photomatix for the first part of the process. If you have Photoshop, it does a far better job of realigning brackets that are not perfectly aligned so use the “Merge to HDR” feature in Photoshop and save the file it generates as a .HDR or .EXR file. Take this file and open it in Photomatix for tonemapping. If you practice these steps, you can usually get a pretty decent HDR even if you don’t have a good way of stabilising your camera.